With Easter just a couple of weeks away, I am teaming up with some super talented ladies to share Easter Tablescape inspiration. 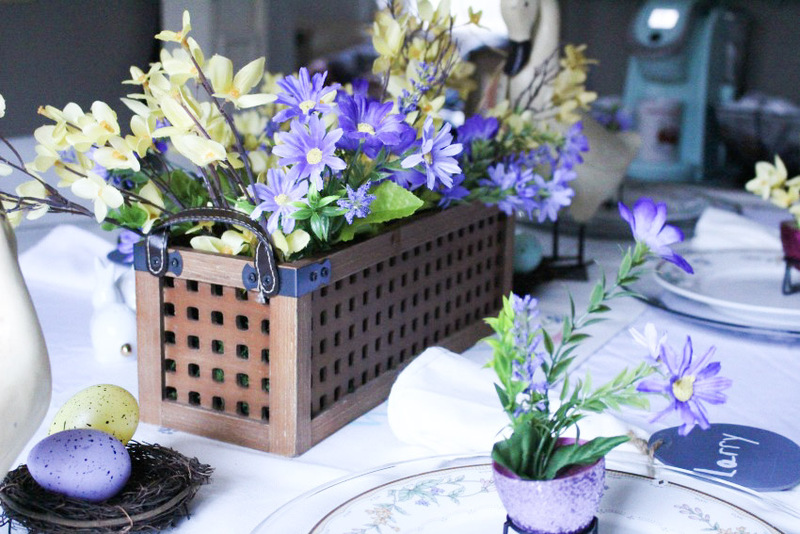 I went with a purple and yellow theme using faux forsythia and dare I say, it is my most favorite Easter tablescape yet! This post is sponsored by Decocrated and contains affiliate links at no extra cost to you. However, all opinions are 100% mine. I only promote product I believe in. Please see my full disclosure here. 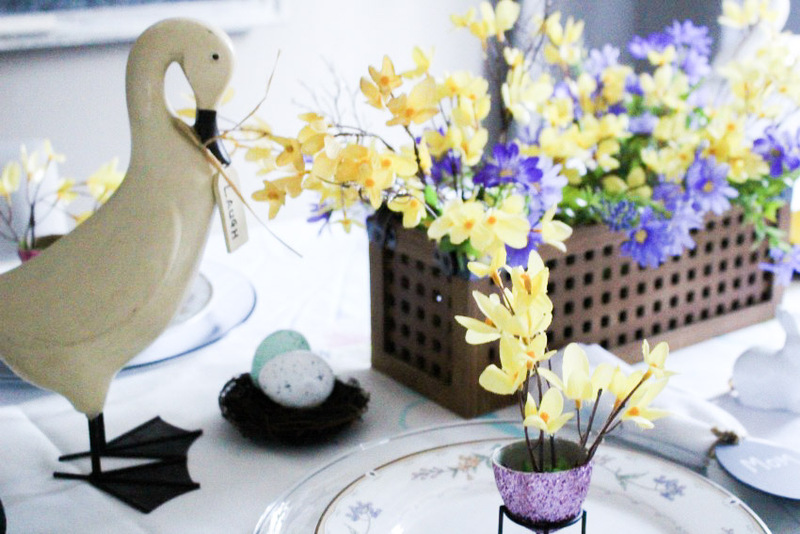 I am back sharing a beautiful Easter Tablescape using pretty purple and yellow. 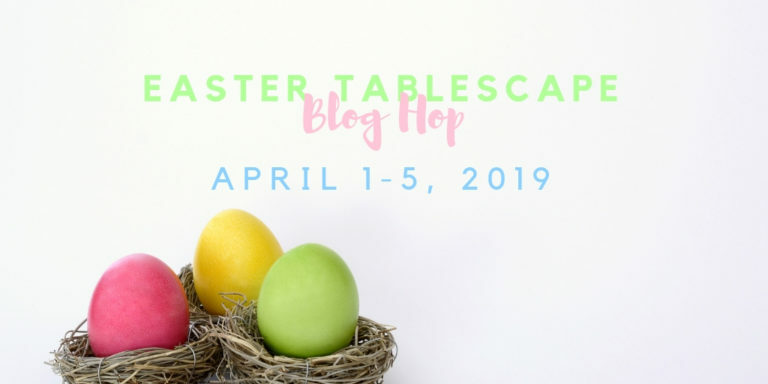 You know how I love teaming up with my blogging friends and this week there are twenty two creative table stylist bloggers sharing their ideas for an Easter tablescape. I hope you will stop by to visit their blogs. Trust me when I say, you will definitely be inspired. I look forward to these blog hops and am always blown away by the creativity. These ladies are talented!! If you are not familiar with Decocrated, they are a home decor subscription box that is sent every three months. I’ll be sharing an unboxing of all the goodies I received this weekend! You can check out what I received in the Winter box here. Once I had the centerpiece planned, I stopped by the craft store to see what flowers would go with the basket. Whenever I think of Spring flowers, forsythia always comes to mind. In Rhode Island, they are one of the first flowers to bloom in the Spring. It was something I always looked forward to each year. I picked up several bunches of faux forsythia at 50% off and couldn’t resist the gorgeous purple flowers. Purple and yellow looks so pretty together, especially in the dark wood basket. As I know I will be changing out this basket seasonally, I simply placed the flowers inside with moss. Easy peasy! They have pretty Spring flowers in purple and yellow-you can’t beat that! Simple glass chargers pair nicely with these dishes. A cute egg shaped chalkboard tag was added to each napkin to act as a place tag. These were from the Target Dollar Spot. Don’t even get me started on how much I love the Dollar Spot! The metal egg holders were also from the Dollar Spot. 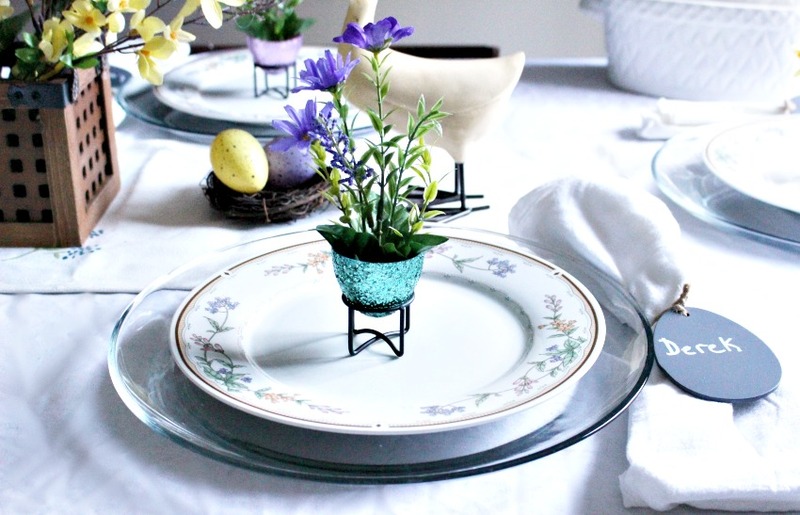 I added the bottom half of a glitter Easter egg with a few silk flowers to sit at each place setting. 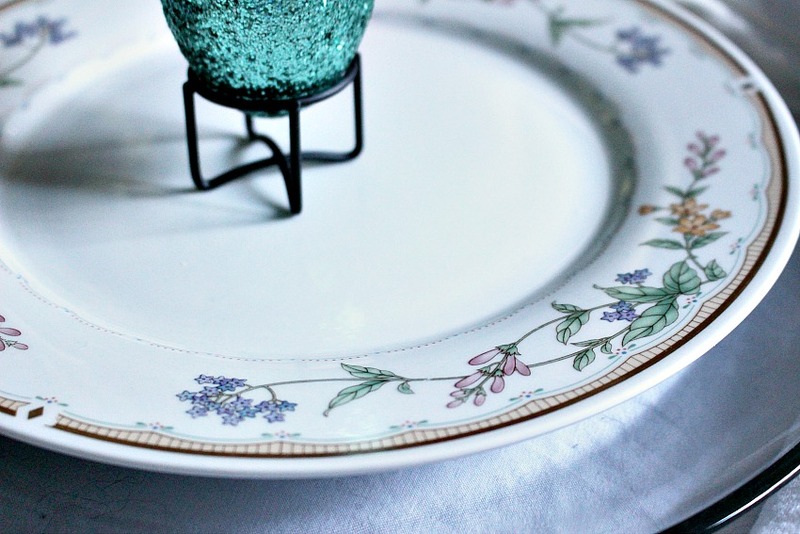 You can see how I made the glitter Easter eggs here. Whenever I set a table, I always have a favor or decorative item at each place setting. I just love the look of it. My go to tablecloth for a Holiday is usually a white linen tablecloth. It is just a classic look and goes with any style decor. Plus, the dishes and flowers really pop against white. Rather than bringing out the bunnies, I went ducks instead. I fell in love with this little piece at my new favorite New Hampshire thrift store, Vinterest. You can read about my fun visit here. The duck soup tureen was another thrift store find! A few birds nests and Easter eggs complete the accessories. The oversized chalkboard is a favorite of mine to decorate. I’m so excited to be a Chalk Couture Designer and love the products they carry. You can check out my Chalk Couture shop here. The adorable vintage truck is my favorite transfer that you can find here. I added more forsythia to the backs of the chairs simply using twine. 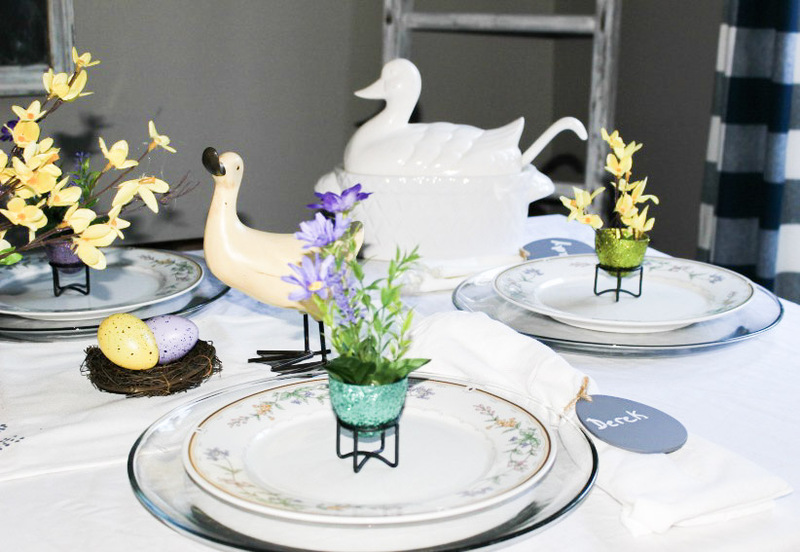 This Easter tablescape is very informal, but welcoming for my small family. I’m a big believer in shopping your home and using what you have. The only items that I bought for this table were the silk flowers. 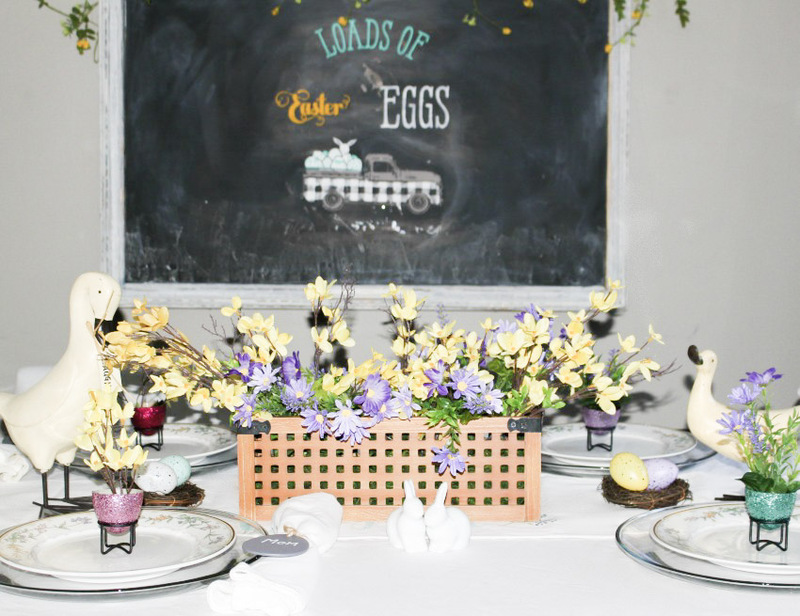 I hope you were inspired by this Easter tablescape. A big thank you to Chloe from Celebrate and Decorate for hosting this blog hop. Have a great day and enjoy the visiting the other tablescapes linked below. Michelle, your table is lovely. 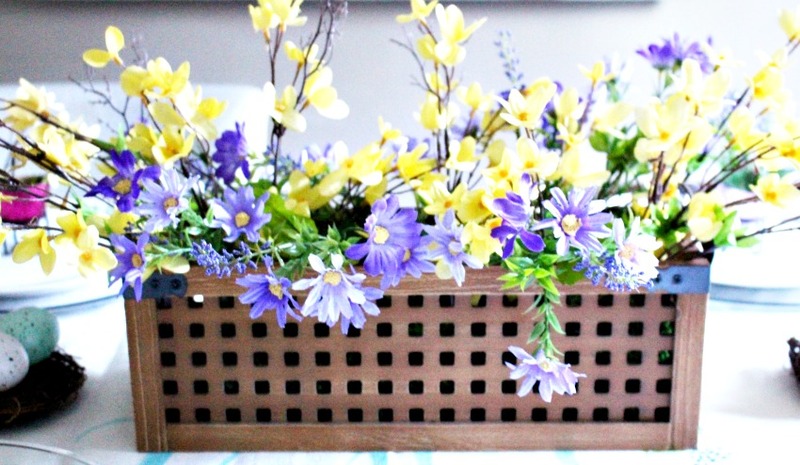 the yellow and purple against your white linen tablecloth is screaming spring. The black board caught my eye and the truck with eggs transfer is adorable. I never have much luck at the dollar spot, probably because I only go to brick and mortar stores about once every couple of months. Yikes! I do almost everything on line and have for over 20 years. But your finds are great. Happy Easter and I look forward to the next blog hop with you. Kari @ Me and My Captain recently posted…It Is Chicken All Day But Are You Dancing Yet? Michelle, such a charming table! Love how you incorporated the egg chalkboard tags as both napkin rings and place card, and favors too! And what a find for only a dollar! I’m gonna stop by Target and see if I can grab a few to use as hostess gift tags this year. What a fun concept to get a surprise delivered to you! Your basket is lovely and can be used in so many different ways throughout the year. 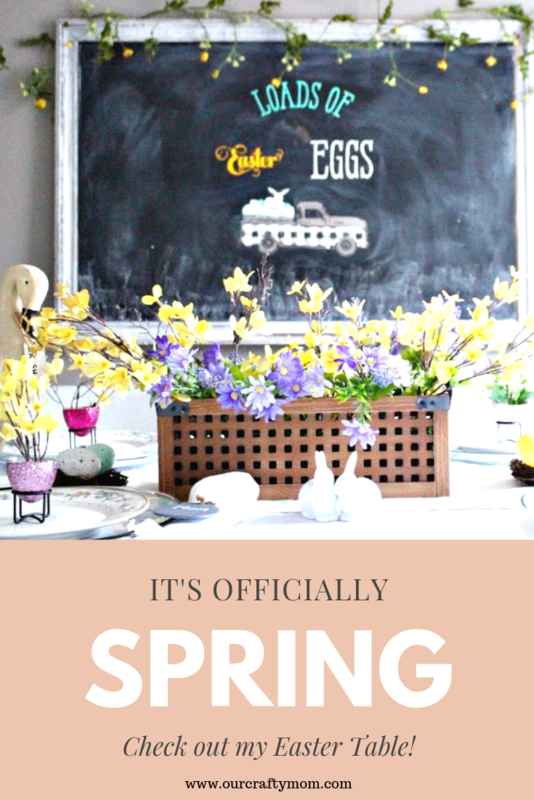 I love blooming branches in the spring, so forsythia is a great addition to your spring table. Thank you dear friend for joining in another hop! Will I get to see you at Haven again this year? Oh Michelle, I love the flowers on the chair backs!! Your centerpiece is so pretty, I haven’t heard of Decorated, I must check it out! It seems like subscription boxes are the hot thing now, my daughter uses Stitch Fix, for both herself and her husband, and I do Sketch Box [art supplies] Isn’t it fun to receive a box full of surprises?? 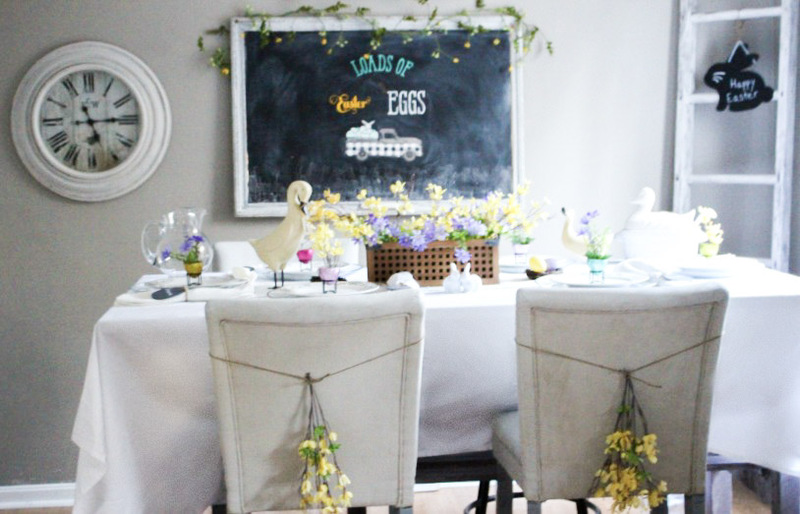 Your table is simply a breath of Spring, love your chalkboard too! What a great hop we had this week! Michelle, I love how you decided to go with ducks for your pretty yellow and purple tablescape. (I have a pair of ducks too.) They fit in beautifully for Easter too and add an element of Spring and whimsy. And your sweet glitter flower egg holder is such a unique touch. They make each place setting pop with color, especially against the delicate and elegant china. Beautiful. Happy Easter! Michelle, I wrote a comment yesterday and lost it and had to leave so I am back today. I love your purple and yellow tablescape. The basket from Decocrated will be very useful in lots of ways and places I am sure. Your cute gaggle (I guess) of geese are adorable. And your chalkboard was a cute backdrop for your tablescape. Great blog hopping with you. Michelle, purple and yellow are wonderful spring colors! How fun to receive a box every three months and the basket makes for a perfect centerpiece. Your ducks are so cute! 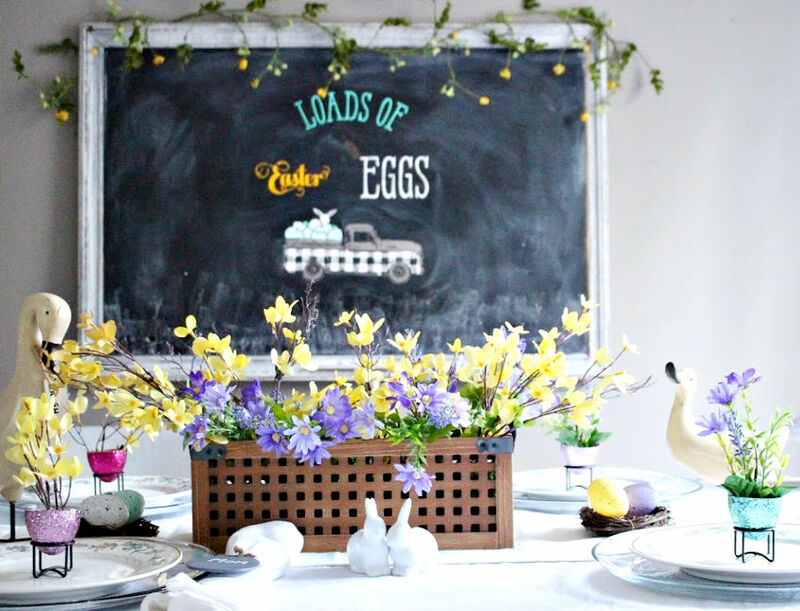 The chalkboard is a delightful backdrop for your lovely tablescape! It is always fun hopping with you! Michelle, what an adorable table! I always look forward to the favors I know you’ll incorporate – such a sweet gesture! I’m not going to lie – I have more than my share of dishes and they are definitely stacking up, so you are not alone in that! lol Thanks so much for the inspiration. Happy Easter to you! I know what you mean about thrift stores, they can be addicting. Lucky for us that you did go in and are sharing the beautiful dishes you found there. 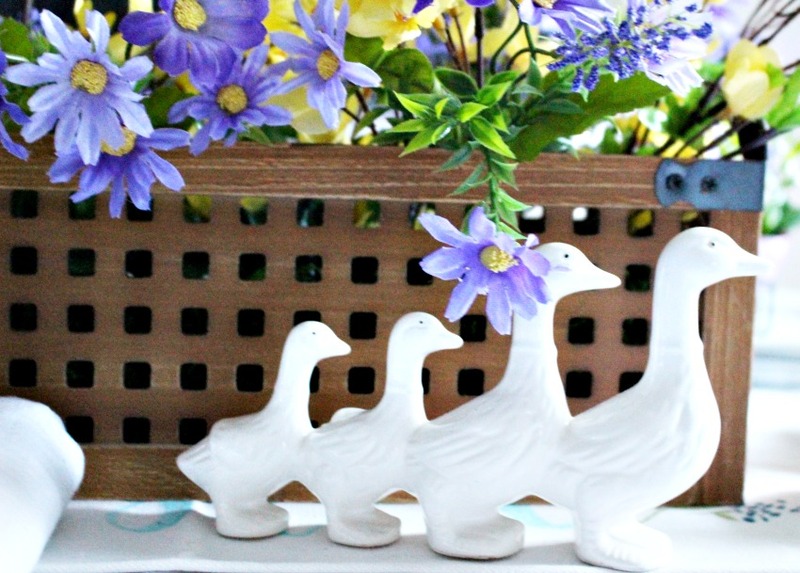 Using ducks instead of bunnies is a fun alternative and I can’t wait to see all the centerpieces you will style with the basket. I love the chair decor and the cute metal egg stands as well. Lovely table and I hope you have a peaceful Easter. Your Easter table is absolutely beautiful, Michelle! I love the colors you chose and those dishes are so pretty. I am a fan of thrifting too! Wishing you and your family a blessed holiday!